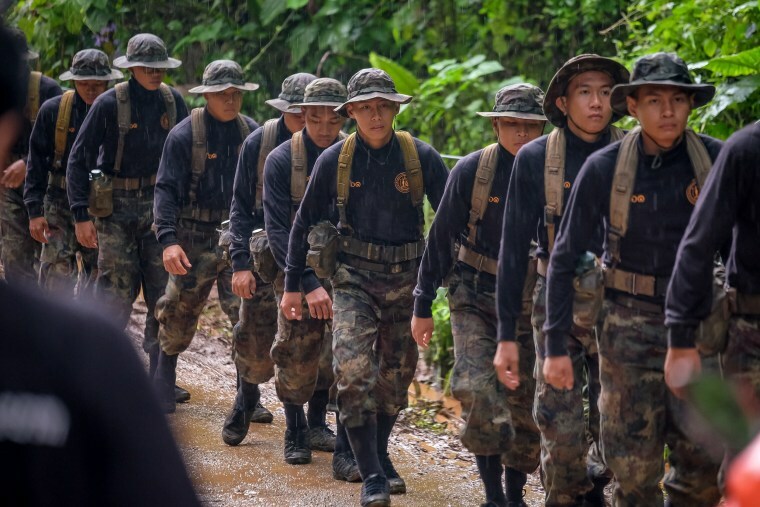 Rescue teams gather in a deep cave on June 25, 2018, where 12 boys and their soccer coach went missing in Chang Rai, northern Thailand. The group went missing after exploring the cave on June 23. Monsoon flooding cut off their escape and prevented rescuers from finding them for almost 10 days. The only way to reach them was by navigating dark and tight passageways filled with muddy water and strong currents. The rescue claimed its first life when a diver fell unconscious underwater and died. 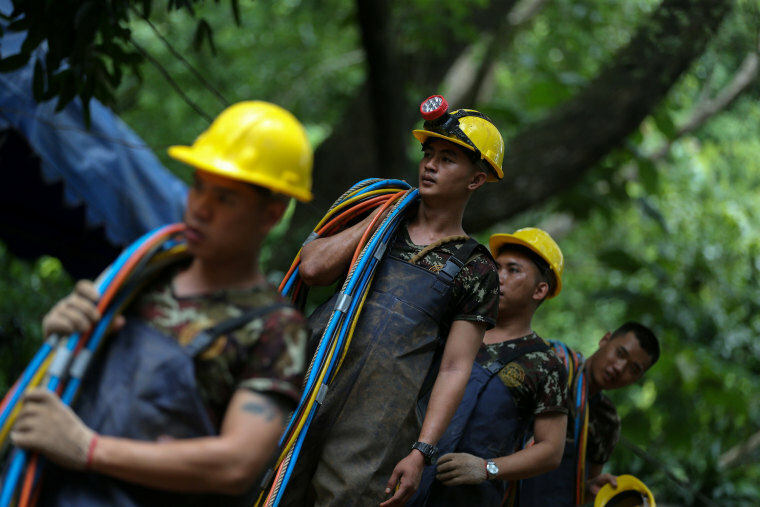 Thai soldiers relay an electrical cable deep into the Tham Luang cave at the Khun Nam Nang Non Forest Park. 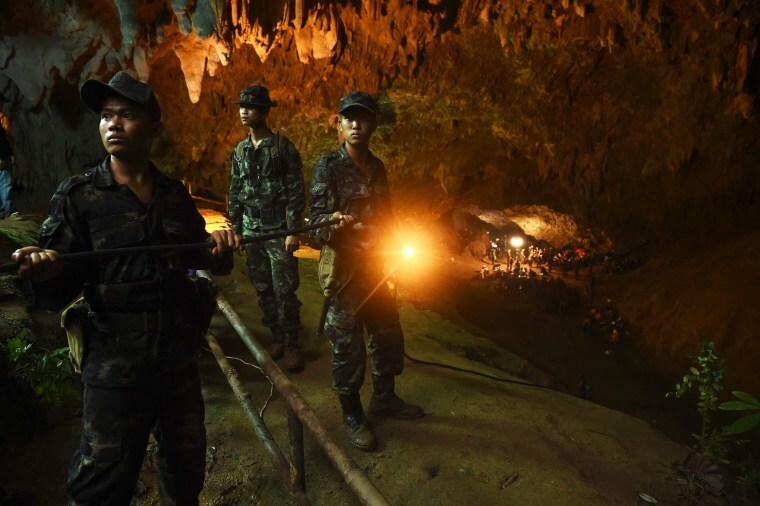 Thai soldiers carry a hose deep into the cave to pump out water. A team of SEAL divers inspect the water-filled tunnel in the cave. 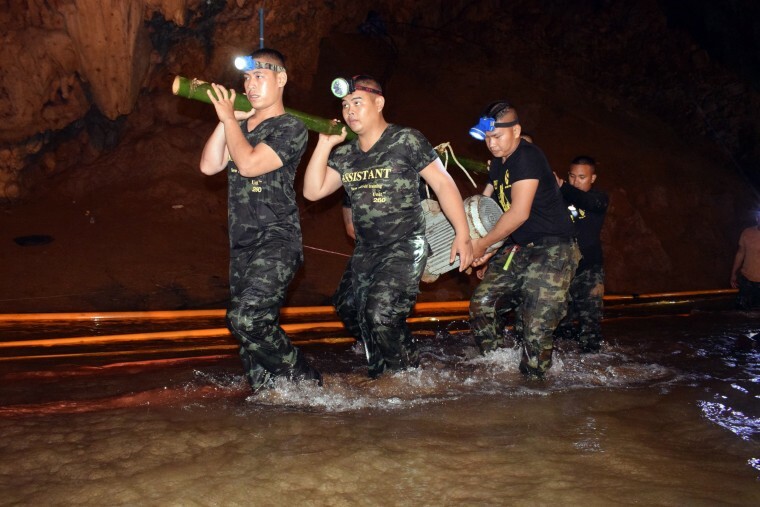 Thai soldiers carry equipment inside the flooded cave complex. 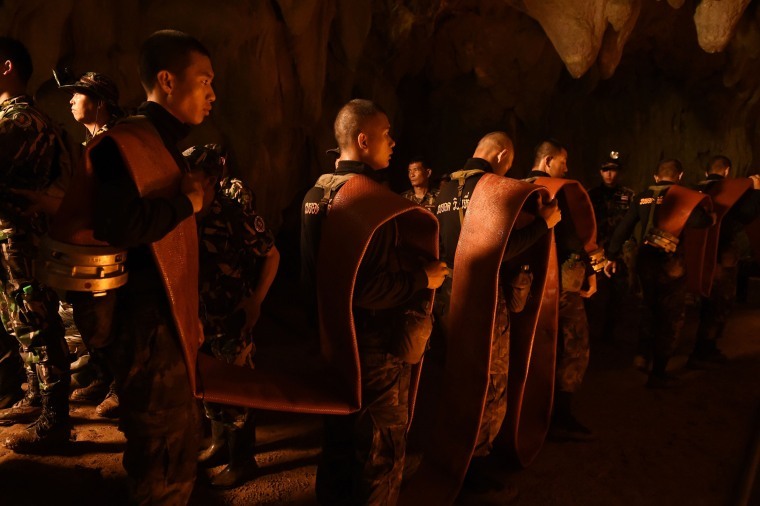 Authorities have raised concerns about how much air the 12 stranded boys and their coach have access to inside the cave. The supply has been depleted by the presence of hundreds of rescue workers. 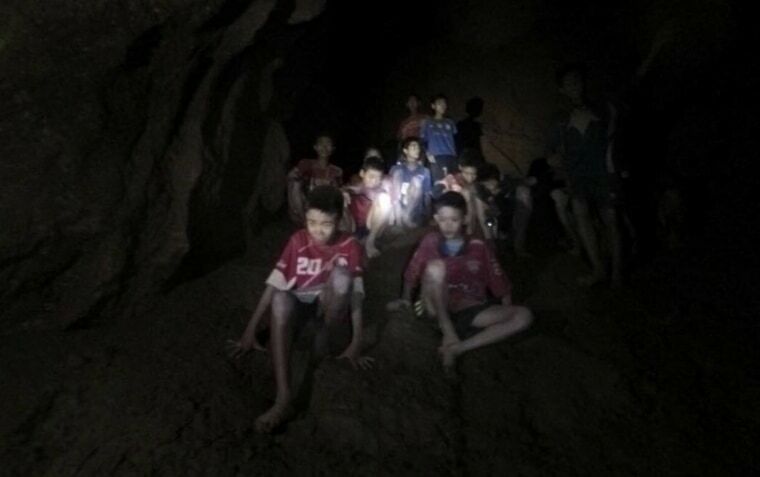 The missing boys and their soccer coach as they were found in the dark, partially flooded cave on July 2. 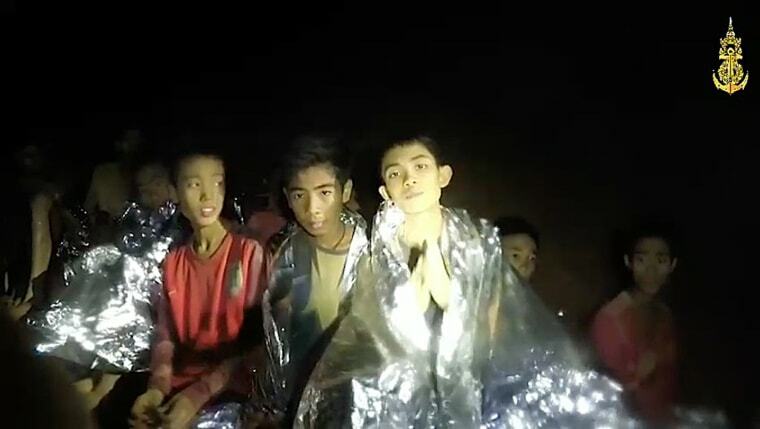 After nine long and arduous days, the boys and their coach were found alive in the cave — a godsend for their anxious families and joyous news for a country that had been riveted to televisions and social media, desperate for updates. 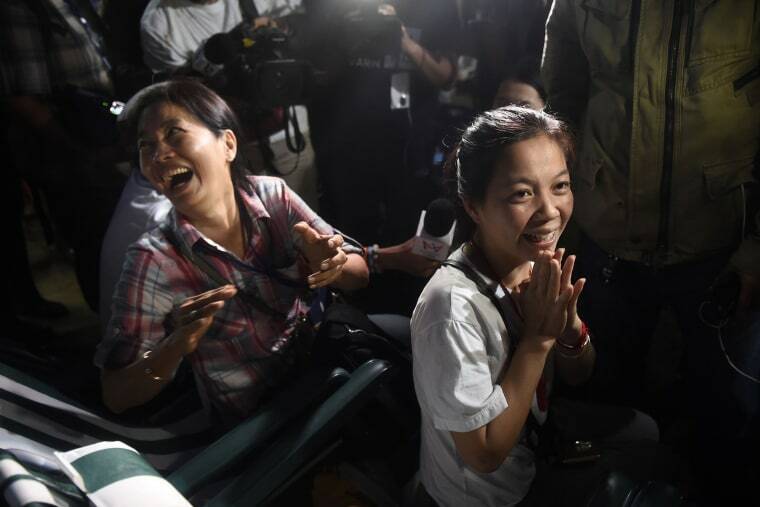 Family members near the cave celebrate the news that the team and their coach were found alive. 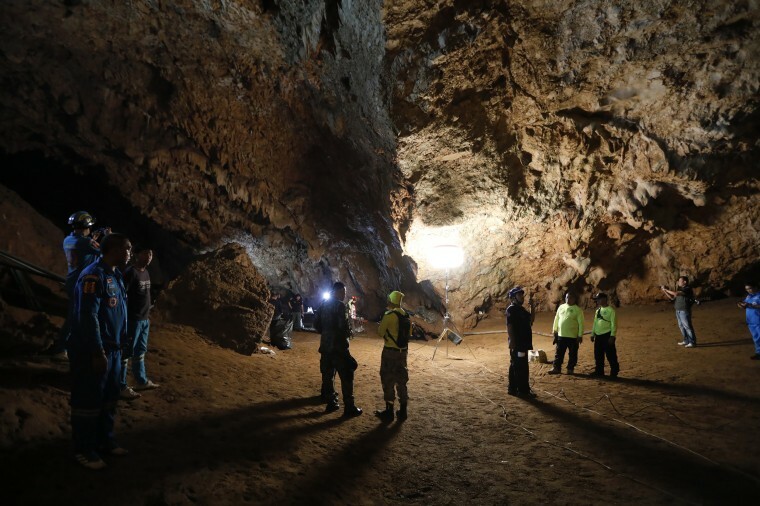 Rescuers are sent inside the cave. Rescuers, including international teams, are considering alternative ways to bring the group out before heavy rains hit the country's north next week, potentially further hampering the operation. Some members of the team in the cave. The Thai navy is teaching the boys the basics of diving, with a view to guiding them out through flood waters. 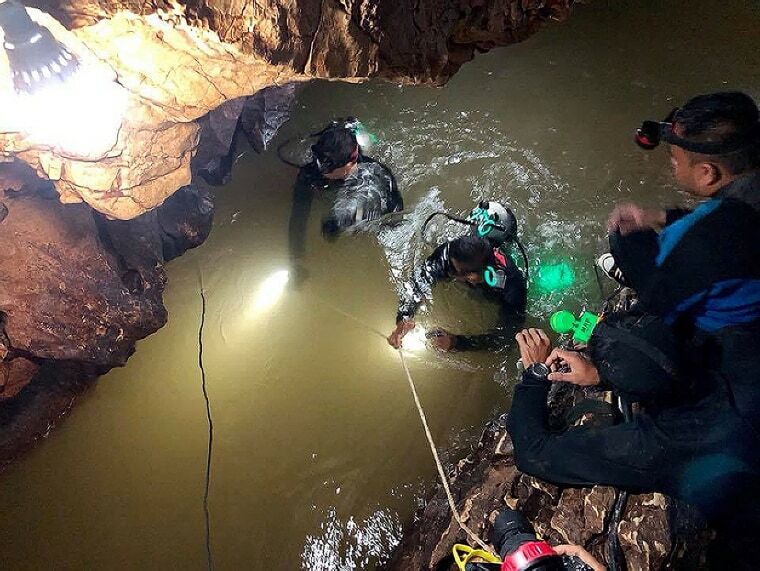 However, some of the boys cannot swim and navigating the cave has frustrated even the most expert divers. 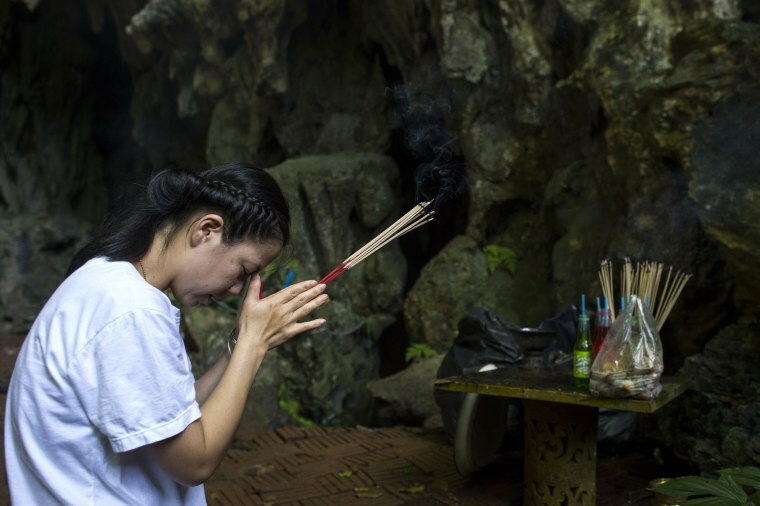 A family member prays before a shrine in the Tham Luang cave area as rescue operations continue. Military personnel carry surface supply diving cables out from the cave complex. Water is pumped out of the cave complex. 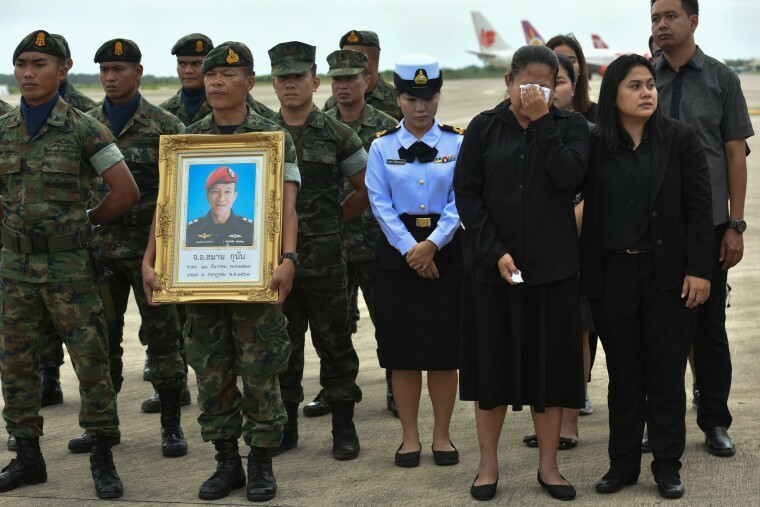 An honor guard holds up a picture of former Thai Navy SEAL diver Samarn Kunan. Kunan, 38, was working in a volunteer capacity and fell unconscious underwater on a mission to place oxygen canisters along the route to where the boys and their coach are sheltered. A letter handed to British divers reads "the kids say don't be worried about them. All of them are strong. They would like to eat many different kinds of foods when they come out and Teachers, please don't give them too much homework." 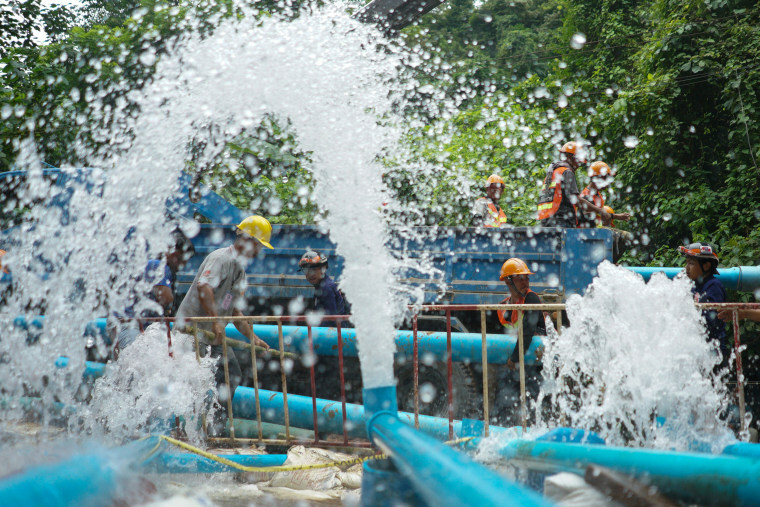 Thai rescue teams arrange water pumping system at the entrance to the cave complex. Nurses wait outside the Chaingrai Prachanukroh Hospital, where the boys will be brought upon rescue. An ambulance carrying one of the rescued boys heads towards the hospital. Onlookers watch and cheer as ambulances deliver rescued boys to the hospital in Chiang Rai. An image from the Royal Thai Navy Facebook page shows rescuers' hands locked with a caption reading "We Thai and the international teams join forces to bring the young Wild Boars home." Classmates of Adul, one of the boys trapped in the cave, visit a tribute to the Wild Boars soccer team at the entrance of Ban Waingphan school. Police and military personnel shield the fifth survivor with umbrellas as he is transported on a stretcher at a military airport in Chiang Rai, Thailand. Two ambulances carry the sixth and seventh boys out of the cave. Thailand's Prime Minister Prayuth Chan-ocha poses with relatives of boys trapped in a flooded cave. Rescue personnel prepare the transport for the evacuation of the boys and their soccer coach trapped in a flooded cave. A group of ambulances go in to Tham Luang cave complex. 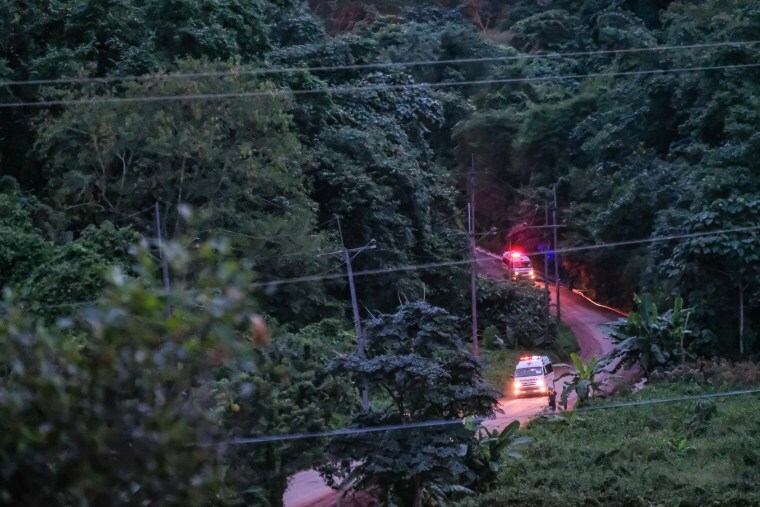 An ambulance leaves from the Tham Luang cave area as the operations continue for those still trapped inside. An emergency team rushes to a helicopter believed to be carrying one of the rescued boys. A television in a mechanic shop plays the news of the boys rescue from Tham Luang Nang Non cave. A helicopter believed to be carrying one of the rescued boys from the flooded cave lands in Chiang Rai. An ambulance transporting members of the children's football team approaches the hospital in the northern Thai city of Chiang Rai. Onlookers watch and cheer as ambulances transport the 10th rescued schoolboy from a helipad nearby to Chiangrai Prachanukroh Hospital.